One means of traveling to Puerto Princesa City and Cuyo Island in Palawan is by slow ferry from Iloilo City. Traveling between Iloilo and Puerto Princesa by sea is a popular means of transportation since there are no direct flight between the two cities. It is also the only practical means of getting to Cuyo especially since chartering a flight to the airstrip in Magsaysay, Cuyo Island is quite expensive. The slow or roll-on roll-off (RORO) ferry takes at least 24 hours from Iloilo City to Puerto Princesa taking a stop-over at Cuyo Island. Two shipping companies ply the route namely “Montenegro” and “Milagrosa” Shipping Lines. Both Montenegro and Milagrosa offer twice weekly service. Be sure to confirm the schedule and fares by contacting the shipping companies. Reserve your tickets one day in advance due to the high likelihood that the ferries might already be fully booked a few hours before departure. The slow ferries depart from the Iloilo River Wharf (Lapuz Side), more popularly known as Muelle Loney River Wharf (not Fort San Pedro, Iloilo City’s main seaport). The Milagrosa and Montenegro terminals are actually located across the river from Muelle Loney St., where the terminal for Bacolod-bound fastcrafts are located. If commuting, take the “Lapuz” jeepneys from Iznart St. or across the Old Provincial Capitol building. Tell the driver to drop you off at the (Milagrosa/Montenegro) RORO terminal in Lapuz. 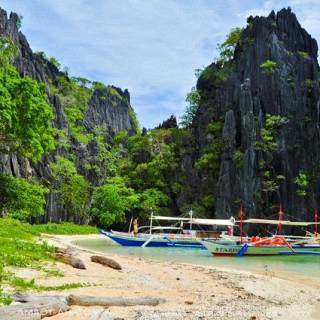 Discover more blogs and travel tips in Palawan, Puerto Princesa City.